If you have dedicated warehouse/shipping staff, or just want to perform your packing and shipping in a single step, you'll save time by using Stitchex's dedicated Pick & Pack interface. After creating pick tickets for your individual customer sales orders, bring up the Pick & Pack interface by selecting "Pick & Pack" from the left, main vertical menu. From this menu, you can edit pick tickets and create shipments. A list of pick tickets are displayed on the right. The top Pick Tickets were created but have not yet shipped. And below that is a list of Pick Lists that have had recently created shipments. As you "ship" pick tickets (converting them to shipments), they will move from the upper list down to the lower list. 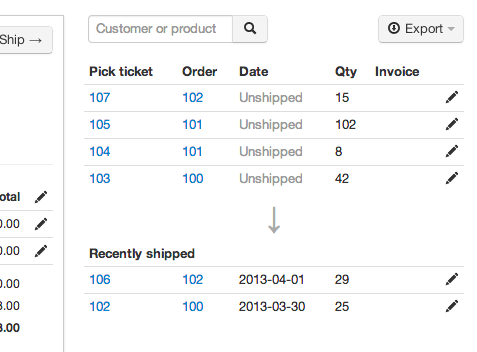 You can filter pick tickets by product or customer using the search box at the top of the list. Click the search button to apply your filter. Enter tracking information (click on the button). Generate a delivery note or commercial invoice PDF. Ship the items (convert the pick ticket into a shipment). For additional information on creating Pick Tickets on individual sales orders, editing pick tickets or creating shipments, please see our Shipping Knowledge Article. Stitchex offers several options for exporting your Pick Tickets to your logistics provider. From the main Pick & Pack menu, select your pick ticket. A CSV or Excel file will download to your desktop containing instructions for all outstanding pick tickets. It will not include data for recent shipments. When you receive confirmation of shipment from your Logistics company, you should manually convert the pick tickets to shipments.